Tuffy says: Azuls Got Chrome is Standing at Stud. AZULS GOT CHROME! 4, yes 4 white socks! And a small blaze! Must have come from mamas side of the family (it was grandma!)! 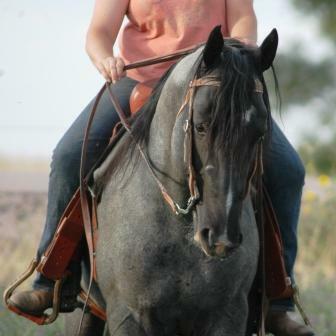 Friendly, agile, VERY cool looking stallion that stands out and makes people take note! His mom is an own daughter of BLUES BEARD so this colt is close up double BLUE VALENTINE. He is such a kind and gentle stud. SMOOTH floating lope like a pleasure horse but great afterburners when you want to chase those cows! NN on his 5 panel test.